The journey from Phuket airport to Krabi is approx 2 hours overland or if travelling from Bangkok there are daily flights that take approx 1 hour. The journey we took was overland from Phuket. On the way we passed through the Phang Nga Bay area and had the chance to see the stunning rock formations that line the coastline up close. Once at Krabi town we were taken to the pier to transfer by speedboat to our hotel the ‘Rayavadee’. The journey was only 15-20 minutes yet I must have taken more photos’ than our entire journey put together. The area is truly breathtaking, the high cliffs and strange limestone formations set against the blue/green water take your breath away. The beaches are nestled amongst small coves of pure, soft white sand and the water is crystal clear. You can do exactly the same trips and tours here as you can when staying in Phuket. The diving and snorkelling are highly recommended due to the beauty of the area. Phi Phi is a small Island that lies in the Andaman sea approx 1.5 hours from Krabi and 1 hour from Phuket by speedboat. The Island is very much a nature/beach lover’s paradise, with a very relaxed feel. The Ton Sai bay area is where the main port is and is busy with tourists and pack packers, stalls selling all manner of goods line the coast and there is an abundance of restaurants, bars and guides selling all manner of trips around the Island. The Rayavadee is a 5 star finest hotel set in a superb location, fringed by three beautiful beaches and dramatic limestone cliffs and located on the edge of Krabi National Marine Park. 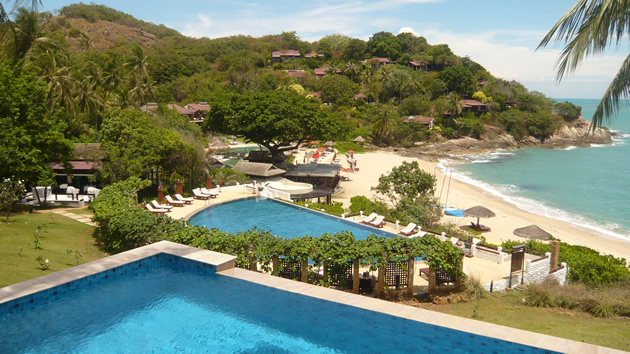 The hotel has almost 100 Pavillion style villas and 5 beachfront 3 bedroom villas. Each villa is set in it’s own plot of land and all are two storeys high. Some have plunge pools and the 3 bed villas have stunning views over the ocean as well as there own private butler. The resort is very elegant and attention is paid to every detail. The service is top notch and the food wonderful. The best thing about this hotel though is its beauty, it is hard to describe in words and even the pictures do not do justice to the lush setting and finely crafted architecture that greets you at every turn. The hotel has something to offer everyone, but is particularly popular with honeymooners, from lazy days on the beach or by the pool, to luxurious spa treatments or for the more active watersports or even Thai cooking classes. The resorts romantic Thai restaurant set on the Phranang beach offers fabulous authentic Thai dishes in wonderful surroundings. On the same beach is also the ‘Grotto’ bar and restaurant. The Grotto is set under a dramatic limestone overhang and serves drinks, cocktails and snacks all day until 8pm. Sipping Margarita’s in the Grotto overlooking the beach and watching the sun go down behind the jutting rocks is a moment you will never forget. Zeavola is a 15 minute speedboat transfer from the main port at Phi Phi. The hotel is set on the beach front and offers travellers the chance to experience Phi Phi at its most natural and beautiful. The resort consists of 52 Thai style villas inspired by the charming dwellings of a rural Thai village. All villas have an open air lounge area with mini bar and tea/coffee facilities, an indoor bedroom and bathroom with large glass windows and French doors on 3 sides and also the option of an open air shower. The rooms are large and comfortable, for those who like to feel that they are outdoors whilst still having the comfort of being indoors this is a must do hotel. The beach is beautiful and the sea so clear that you can still see the ripples in the sand at the bottom when you are quite far out. The hotel offers 2 restaurants and a Spa, however there are other restaurants nearby if you wish to venture out.